My goal with this book is to make exploring the Istrian peninsula both easy and fun using Google Maps. Section 1 (Chapters 1 – 11) covers all major destinations in Istria and top recommendations for each destination. All recommendations are included in the Best of Istria Google Map (https://goo.gl/YBkrmR). Section 2 (Chapters 12 – 38) has 25 trips for each interest category, with each trip accompanied by its unique Google Map. 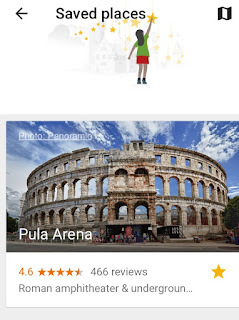 As a Google Local Guide, I see practical value in connecting the Best of Istria book with Google Maps so that you can learn more about the place, find its location, and use Google directions to get there, see pictures, get contact information, and read reviews. By tying Best of Istria book with Google Maps, I hope to provide you with a practical guide for exploring Istria that is truly unique. The guide begins with a Need to Know chapter that contains practical information you will appreciate knowing when exploring Istria by car. It covers official documentation required, motoring advice, and much more. All topics are arranged alphabetically so you can easily find the topic of interest. The Overview of Istria chapter contains a brief verbal picture of Istria and its history. Chapters 3 - 10 contain a review of all major destinations in Istria and top recommendations for what to see and do in those destinations. Chapter 11 lists major events in Istria organized by seasons. The 25 trips in chapters 12 – 37 capture the diversity of the Istrian peninsula, stretching from the beautiful coast of Blue Istria to the mesmerizing hillside towns of Green Istria. Istria is large enough to offer a variety of diverse experiences and yet small enough so that one can travel to any part of Istria in less than two hours. These trips can be traveled over a number of days, with a sleepover near each stop, or over a course of a day or two from a fixed destination. The flexible nature of Google Maps means that you can customize the Google Maps that I’ve provided so they best fit your plans. Google Map links are provided for all places reviewed in the book so you can easily locate them on Google Maps, get driving directions, and read Google reviews of those places. All recommendations have also been compiled in the Best of Istria Google Map. Over the course of writing this book I’ve added hundreds of places to Google Maps. These places didn’t exist in Google Maps until I added them. Now that they’re listed in Google Maps, it will be easier for everyone to discover Istria's most beautiful spots, and add their own photos and reviews of places. If you come across any new places that are not yet in Google Maps, please consider adding them with the Google Maps app on your mobile device. Each trip also includes a Google Map of that trip, making it available for you to copy and modify in your Google Maps. Your interests and time availability will help you to decide which trips to explore and how to modify the stops. I hope you’ll find Google Maps a valuable tool for pre-trip planning and a handy guide when on the road. 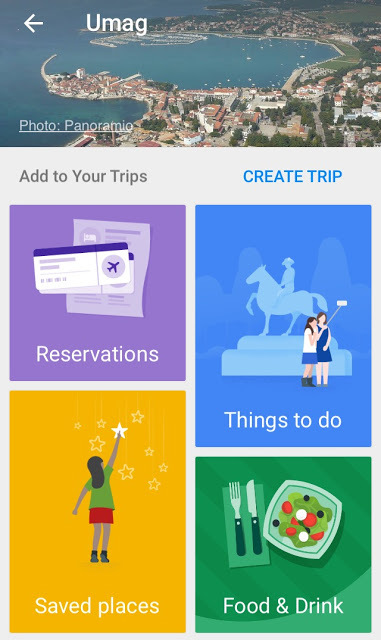 Google launched the new Google Trips app in September of 2016. Google Maps revolutionized how we travel and Google Trips will revolutionize how we vacation. 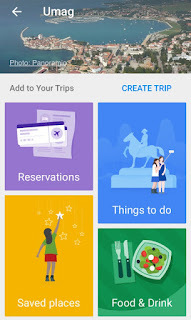 The Google Trips app uses data from your Gmail account, Google Maps, and crowd sourced contributions from other travelers to create a personalized tour guide within the app. As a member of Google Local Guides, and owner of the Croatia Local Guides Community, I helped improve data about Croatia, including Istria, during the beta testing. See Google Trips for more information on how to make the best use of Google Trips. One of the best features of Google Trips app is that it syncs with saved places in Google Maps. As you read through this book and discover places you’d like to visit during your trip to Istria, save them in Google Maps by clicking "save" button in Google Maps (see Pula Arena example). 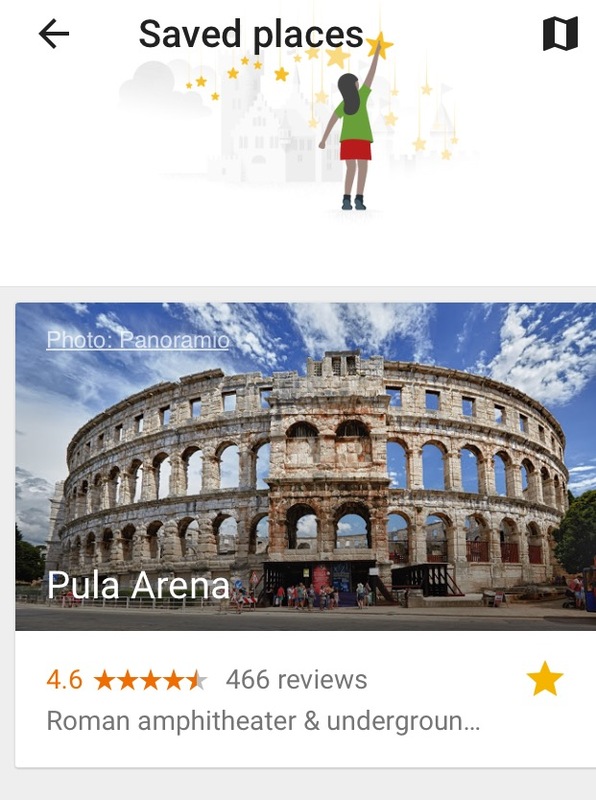 Once saved in Google Maps, saved places will automatically show up in the “saved places” section of the Google Trips app (see Pula Arena example). When you arrive to Istria, you can then use Google Maps or Google Trips to visit your saved places. If you don’t expect to have internet access while in Istria, you can download the maps and trips before travelling so that you can use them offline while in Istria. See Google help page for more information on how to download Google Maps for offline use.